Field Centre in order to make observations on the Derwent River profile and collect data on Hornsea and Mappleton’s coastal defences. We made the visit with the intention of collecting necessary data for our GCSE Geography Paper 3 Exam. and more, along a transect. For most of us this was successful, except that a certain member in our group ended up falling into the river as soon as they entered it. as an introduction to what we would be doing the next day. After this, we spent the rest of the night in the games room playing table football and table tennis. the groyne and then the north side. On the beach, we measured each time the beach profile changed and the dominant particle size of the sand at these points. 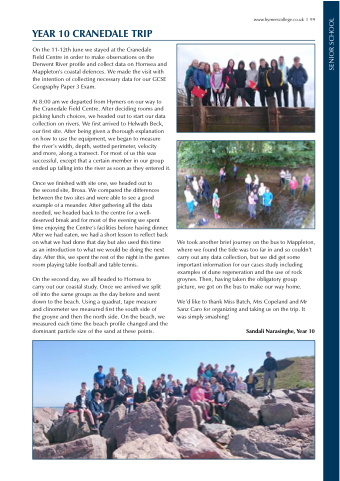 We took another brief journey on the bus to Mappleton, where we found the tide was too far in and so couldn’t carry out any data collection, but we did get some important information for our cases study including examples of dune regeneration and the use of rock groynes. Then, having taken the obligatory group picture, we got on the bus to make our way home. We’d like to thank Miss Batch, Mrs Copeland and Mr Sanz Caro for organizing and taking us on the trip. It was simply smashing!